Batterers often use a pet as a tool to seek revenge against victims. Hauppauge, NY - October 3, 2016 - October is Domestic Violence Awareness month. The link between Domestic Violence and Animal Abuse is well known and victims often delay or refuse to leave the home for fear of what is going to happen to their pets. Batterers often use a pet as a tool to seek revenge against victims. Roy Gross, Chief of the Suffolk County SPCA said that with 68% of American households believed to have pets, and with as many as 71% of survivors of intimate partner violence reporting that their animals were harmed or threatened by the batterer as a way to intimidate, retaliate or seek revenge, animal abuse is a potent force creating additional layers of fear in domestic violence. According to researchers as well as the FBI, most serial killers had killed or tortured animals as children. 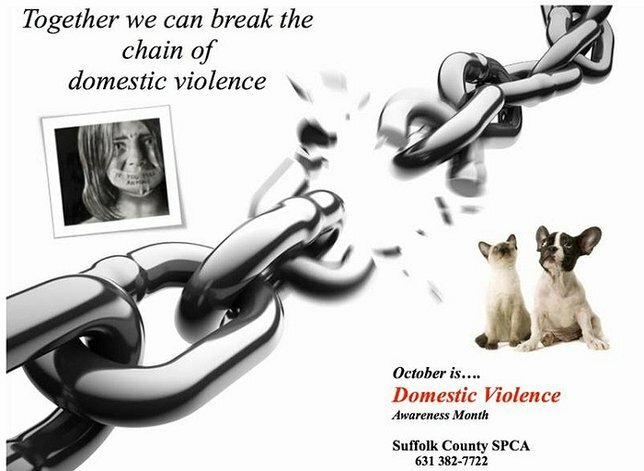 Subject: LongIsland.com - Your Name sent you Article details of "SCSPCA: October is Domestic Violence Awareness Month"